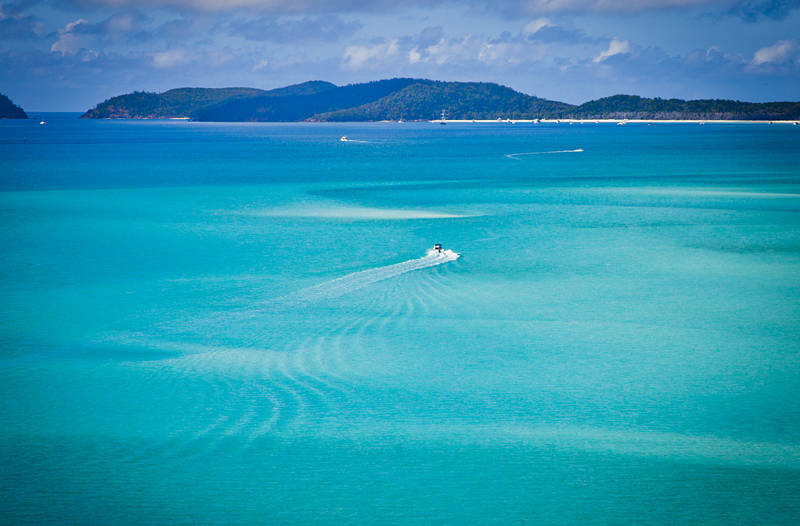 This was taken from the Northern end of Whitehaven Beach on the Whitsunday islands in Queensland, Australia. Beaches seem to have a primaeval allure. Some scientists believe life could well have begun on a beach because it is a place where gasses, liquids and solids are constantly being mixed, so the chance of useful life-giving chemistry is higher than in air, sea or land alone. The beach here is 98.7% silica which makes it both unique and a mystery as the local rocks are the wrong composition to produce it. The silica is so fine it feels soft but after a few hours of walking in it, you realise you have lost most of the skin from the soles of your feet. Its purity and grain size make it blindingly white and apparently of interest to NASA. Although there are substantial fines for removing this finite resource it is claimed an exception was made to build the Hubble Space Telescope. After freezing inland during a month-long photography tour of the Bowen Basin mining area it is nice to get back to the stable temperatures of the coast. After I visit the Australian Institute of Marine Science on Friday I will resupply in Townsville before continuing North while it is still possible in this Southern hemisphere winter.